As I was doing a ceiling to floor cleaning of my kitchen and dining room last week. I came across this Starbucks cocoa can I had lying around. It was black so I thought it will be perfect to dress it up and use it as my new catch all can on my new craft table that I'll be bringing into the house tomorrow. I decorated it pretty simple just wanted to keep things simple. I will use this can on my table to put pens, bone folders, markers, scissors, etc while I'm stamping. Then I'll put them in their rightful places later. But at least they won't be rolling around the table as I try to work. 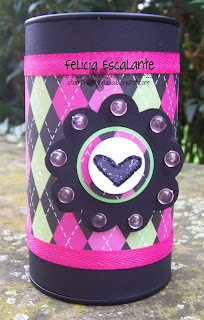 I used a flower chipboard piece by Stampin' Up! and I covered it with Basic Black cardstock. I used circle punches, and Taylor Tots to decorate it. The raspberry twill ribbon is from Taylored Expressions.